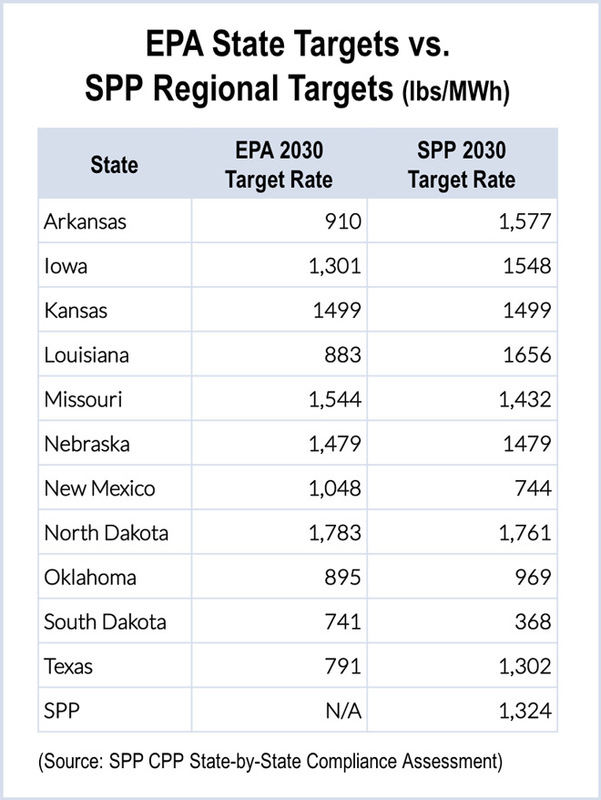 SPP’s latest analysis of the Environmental Protection Agency’s draft Clean Power Plan indicates state-by-state compliance with the plan would result in nearly 40% higher costs than a regional approach. The assessment analyzed the rule’s impact on existing generation and resource-expansion plans. It did not include the cost of new transmission needed to maintain reliability, gas-infrastructure expansion, market-design changes or transmission congestion. A final version of the rule is expected to be released in August. The draft version proposes reducing U.S. carbon dioxide emissions 30% from 2005 levels by 2030. Nickell offered the example of one state taking a physical approach to carbon-reduction and limiting the amount of coal generation in November and December, only to have a neighboring state take a different approach and add renewable generation. That might force the first state to resort to additional coal generation to maintain grid reliability. SPP’s analysis was based on EPA’s proposed individual state-reduction goals in its draft rulemaking. SPP said its study does not take a position on the appropriateness of those goals or EPA’s supporting assumptions. SPP’s state-by-state approach used the same analysis format as it did with March’s regional approach, using a $45/ton carbon-cost adder for an “apples-to-apples” comparison between the two plans. As before, the carbon adder was used as a mechanism to simulate the dispatch of lower carbon-emitting resources. The assessment says up to 15.1 GW of generation expected to continue running under current planning assumptions could be at risk of retirement under a state-by-state compliance approach. The study also added 5.5 GW of wind energy and 4 GW of gas-fueled resources above currently planned capacity, which already includes approximately 4 GW of new wind and 22 GW of new gas resources. However, the assessment did not take into account renewable tax credits, currently being debated in Congress. The Senate Finance Committee last week voted 23-3 to approve extending tax credits for wind energy, along with subsidies for biodiesel and cellulosic ethanol. SPP did use wind as a reasonable abatement measure in both the regional and state-by-state compliance assessments, because of the high wind potential in most SPP states and the desire to maintain a consistent approach for comparisons. 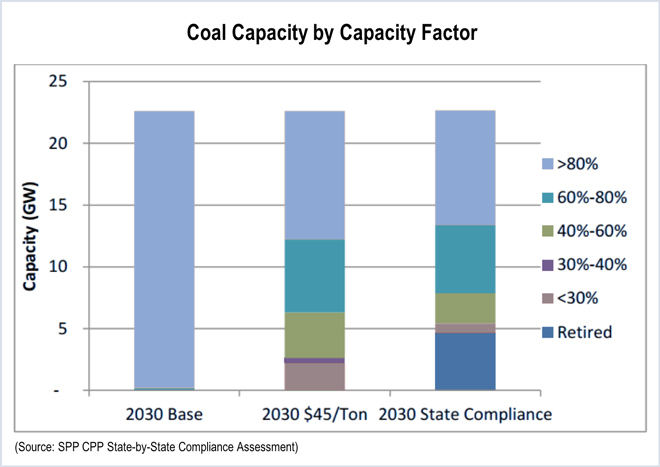 The state-by-state compliance scenario’s analysis assumed approximately 4,700 MW of coal retirements incremental to those retirements already planned. SPP said this assumption could be conservative, as its analysis indicates nearly all the region’s existing coal-fired generation would operate above an 80% capacity factor in the business-as-usual model, but approximately 13,400 MW of coal-fired generation would operate below an 80% capacity factor after applying the $45/ton carbon-cost adder. The state-by-state assessment used three different models: a business-as-usual (BAU) case, a BAU model with the $45/ton carbon-cost adder, and a third model with a variable cost adder. Incremental coal retirements were assumed using a tiered approach. The first tier came from additional information gathered in preparation for a 2017 transmission-planning study. Updated projections found an additional 300 MW of coal units expected to be retired by 2030. The next three tiers took an age-based approach, targeting units’ ages in 2030: over 60 years, 55-60 years and 50-55 years. The state-by-state compliance plan is the third study SPP has conducted of the proposed Clean Power Plan. The RTO’s first study in October 2014 found that the rule did not allow enough time to build the generation and transmission infrastructure needed to maintain system reliability and avoid severe system overloads that could lead to cascading outages. SPP could meet EPA’s 30% CO2 reduction target with a $45/ton carbon adder and 7.8 GW of additional generation, most of it wind, according to a report issued last week by the RTO.